Thursday in Whitewater will be increasingly sunny with a high of fifty-one. Sunrise is 6:54 AM and sunset 7:08 PM, for 12h 13m 48s of daytime. The moon is full with 99.8% of its visible disk illuminated. Today is the eight hundred sixty-second day. On Sunday, March 21, close to 8,000 people assembled at Brown Chapel A.M.E. Church to commence the trek to Montgomery. Most of the participants were black, but some were white and some were Asian and Latino. Spiritual leaders of multiple races, religions, and creeds marched abreast with Dr. King, including Rev. 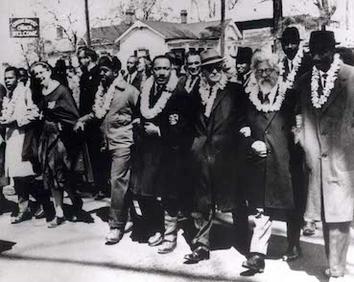 Fred Shuttlesworth, Greek Orthodox Archbishop Iakovos, Rabbis Abraham Joshua Heschel and Maurice Davis, and at least one nun, all of whom were depicted in a photo that has become famous. MADISON – Assembly Speaker Robin Vos is refusing to testify in Wisconsin’s gerrymandering case, opening a new front in a long-running legal battle over how election maps are drawn. “Assembly members, including Speaker Vos, have waived any claim to legislative immunity in this case by intervening as a defendant and actively participating in the litigation, including filing motions and discovery requests,” attorney Ruth Greenwood wrote in her filing. Well…A gawdam librul Dane County Judge laid some wood on the R-Team lame-duck perversion of democracy this afternoon. He declared all of the power-grab illegal, as Fitz and Vos did not have the constitutional authority to call the special session. Only the Gov has that power, and Walker did not do so. Walker screwed-up really badly there. No legal session means that no laws passed in the session are valid. So…All of the lame duck laws are declared illegal and an injunction is in place restraining any enforcement of those laws. This will be appealed, but the law is pretty clear. Whether the WI SC interprets it as so will be very interesting, and is likely to juice up the SC election a couple of weeks away. Evers gets control of WEDC, which may make Fitz and Vos very happy, as WEDC has turned from a way to fund supporters to a giant Foxconn-loaded anvil around their necks. It will be interesting to see what Evers does with the metastasizing disaster named Foxconn. Eighty two last minute political appointees of Walker that were rammed thru, installed as a kind of right-wing deep-state on various boards and commissions, are also un-appointed. The lege R-team now has to rely on the D-team AG to defend their revanchist pipe dreams. They don’t get to hire their own lawyers any more. Meanwhile, Walker apparently has signed on as national finance chairman of a group solely dedicated to protecting Republican Gerrymanders. His exchequer must need refreshing, as he has been all over the news this week with his various employment opportunities. I can’t see as this gig will look all that great on his resume if he is really serious about running for senator or governor.